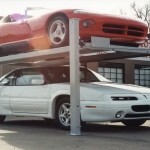 Most automobile enthusiast cars are among their most valuable possessions. 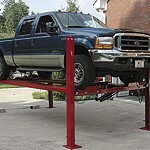 The SG-7000 is made to the highest standards and is regarded as the best of the best in the automotive lift industry. Best Seller The SG-7000 series is our most popular line of lifts. Every lift in this series is MADE IN THE USA. 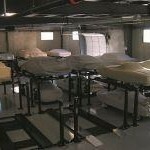 They are the safest, most reliable, free-standing, portable lifts on the market. Perfect for under-car maintenance like oil changes, tire and brake, exhaust, and detailing. SPACE SAVER !!! 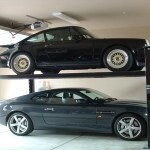 The SG-7000 lifts are also a great way to add space to your garage. Just raise one vehicle and park another underneath. 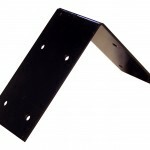 Great for storing mowers, personal watercraft, golf carts, etc. We’ve even seen a woodshop mounted on one of our lifts. The sky’s the limit… literally… you can store just about anything on the SG-7000 and still have room for your car underneath. Our lift may be the most copied lift ever. While we are flattered by it, upon further review, they (china) haven’t done a very good job. Inferior tensile strength in their steel, razor thin bushings, poor grades of hydraulic components and hardware, and lack of quality control have caused catastrophic failures all across the US. Remember, this is a once in a lifetime purchase… is saving a few dollars really worth it? A Lift to Meet Every Need. The SG-7000 is available in three different models. 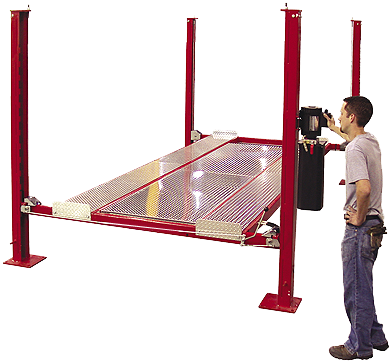 The standard SG-7000 (our best-selling lift) features a 71″ rise. For storing SUV’s and Pickups, the SG-7000XLT (extra long and tall) is 20″ longer and raises 10″ higher than the standard model. If space is a problem, the SG-7000N is 6″ narrower. The XLT can also be ordered in the narrower version. Designed for Your Garage. 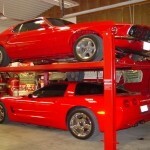 Most people are shocked to find out that they can install a lift in a normal garage. The SG-7000 was originally designed in 1992 to fit into an average garage. It actually uses less space than your car. It can be operated with a 110V or 220V power unit that works with most normal house currents. We know that you could settle for one of the cheap Chinese lifts, that’s just one of the reasons we have to make it better. We cut and form every part on CNC machinery in our factory in Burleson, TX. Your lift will also be welded by skilled American Workers and engineered by some of the finest in the lift business! 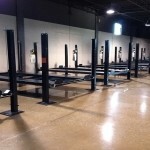 Your lift will go thru a minimum of 10 Quality control check points before shipping! Our own in house powder-coating system allows you to have a large choice of colors and has a “show quality” finish. We do not use any inferior components on this lift. Your safety and your vehicle safety relies on it!!! Here to Stay. Since our inception in 1992 we’ve sold lifts to many, many, celebrities, athletes, automobile manufacturers, Fortune 500 companies, and 20,000 + regular guys who we value just as much. Although we were chosen for our outstanding quality and service, we have also outlasted most of our competition. Inferior quality and poor service has taken out most American Lift manufacturers. The Mexican Lift companies invaded in the late 90’s and disappeared a few years later. It’s only a matter of time until China’s poor quality catches up to them also. In the meantime, RadLifts will be here building “nothing but the best” for our customers. Locks in at 71″ with optional pin kit. The 36″ approach ramps store between the rails — not on your garage floor. Our original design provides safety from moving parts and long –lasting great looks. 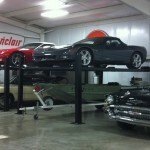 Just add the optional caster kit (pg 6) to wheel your lift freely around your garage. 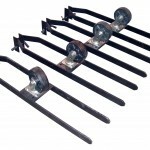 Grade 8 bolts and welded reinforcements hold guides that keep your lift upright with no anchors needed. The largest cylinder in the industry. We provide a lifetime guarantee on the seals. 14,500 lbs lifting strength per cable. A combined rating of 58,000 lbs! Baked on at 450 degrees. Rivals most automotive finishes. MAX DECK HEIGHT 75" 85" 75" 85"
OVERALL LENGTH WITH 36" APPROACH RAMPS 202" 222" 202" 222"
OVERALL RUNWAY LENGTH 160" 180" 160" 180"
OVERALL HEIGHT 84" 94" 84" 94"
OUTSIDE COLUMN WIDTH wo/MOTOR w/MOTOR 108"/119" 108"/119" 102"/113" 108"/119"
BETWEEN POSTS 98.5" 98.5" 92.5" 98.5"
FLOOR SPACE FOOTPRINT L170" x W112"	 L190" x W112" L170" x W112"	 L190" x W112"